Colonies of honey bees include three distinct types of individual organisms: the Drones, the Workers, and theQueen. 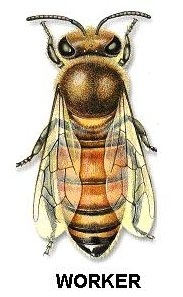 The drone honey bees represent the males in the colony as they are reproductively active and produce the sperm used to fertilize the Queen’s eggs. However, they are unique in that they contain half the chromosomes (haploid) of the females and are developed forms of unfertilized female eggs. This literally means they have no fathers. 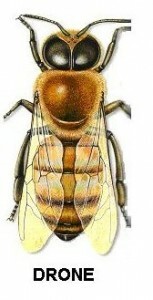 The unfertilized eggs are laid in the larger horizontal cells called “drone comb”. After 24 days (on average), the adult drone emerges with the most robust body of the three types and large eyes that meet on top of their head (dorsally). The primary and singular function of drones for the colony is to mate. Successful mating results in death, making these males entirely monogamous. On average, drones live for 20 days and are specifically produced by the colony on during specific times of the year when mating is happening (typically in spring). The worker honey bees are sterile females (99% true) that perform the great majority of the work for the colony. As females, they develop from fertilized eggs that are laid in standard horizontal cells (general comb). After 21 days (on average), the adult Worker emerges and progresses through a series of jobs, switching as she ages. Generally, she takes care of the brood and other individuals first, then the maintenance of the colony, and finally is allowed to leave the colony for defense and foraging. Workers make up the majority of a honey bee colony. The lifespan for workers varies on the amount of work they do, based upon the wear and tear they put on their bodies. On average, the lifespan for workers is as follows: summer = 15-38 days, spring/fall = 30-60 days, winter = 100-140 days. 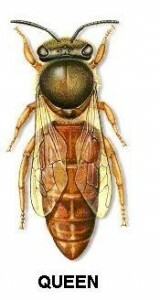 The queen honey bee is the single egg laying female in the colony (99% true). As females, they develop from fertilized eggs that are laid in vertical cells (Queen’s cup).